It seems incredible that it is almost three months since we left Nimrod in Marina Di Sant’Elmo. Jo has come back to check everything is okay and oversee the engine service. We would normally do this ourselves but we get an extra year’s warranty if the first full service is carried out by a Volvo certified mechanic. They were booked in for 9am and arrived about half an hour later, which is pretty good going by Med standards. One and a half hours and €360 later, it was all finished. They provided the oil and parts which cost us €180 so you can see why we do it ourselves and buy the parts in the UK! Still, good to have the extended warranty – just in case! Generally, the boat seems in good condition and none the worse for her first winter of the Mistrals although there appears to be a blockage in the gas regulator that won’t budge so dinner last night was a bag of crisps and a banana! Out tonight for a local pizza at the Pesce d’Oro – our favourite restaurant in Alghero. We will sort the gas when we are back here next month. The weather is warmer than UK during the day but drops to 2/3 degrees at night so glad the heating is working fine. 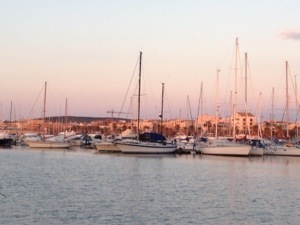 Pictures below of the harbour at sunset and Nimrod at her mooring. This entry was posted in Equipment, News and tagged 2013, Italy, Maintenance, Med, Sardinia. Bookmark the permalink. Looks lovely.Where are you offto next?